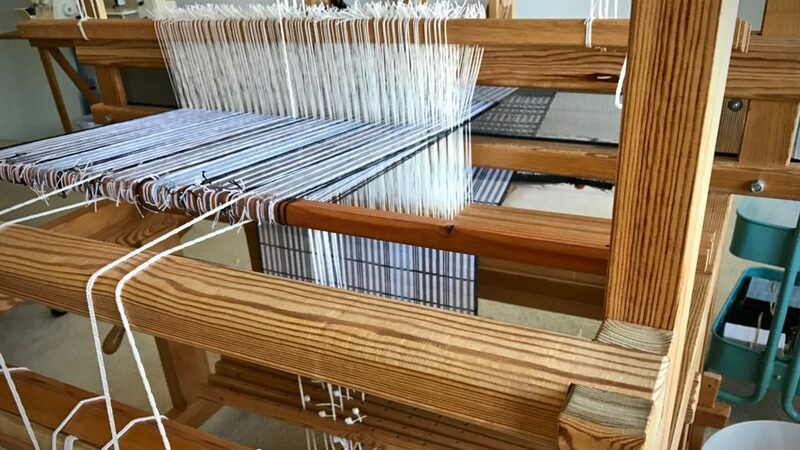 The weft makes or breaks a weaving project. 16/1 linen weft requires careful weaving, but the quality of Swedish Bockens linen won’t disappoint. If you use superior quality warp thread, like this Swedish Bockens Nialin (cottolin), it makes perfect sense to choose a weft that equals that degree of excellence. Plattväv table runner. Black 16/1 linen is doubled for the pattern weft in this plattväv design. The background tabby weft is golden bleached 16/1 linen. 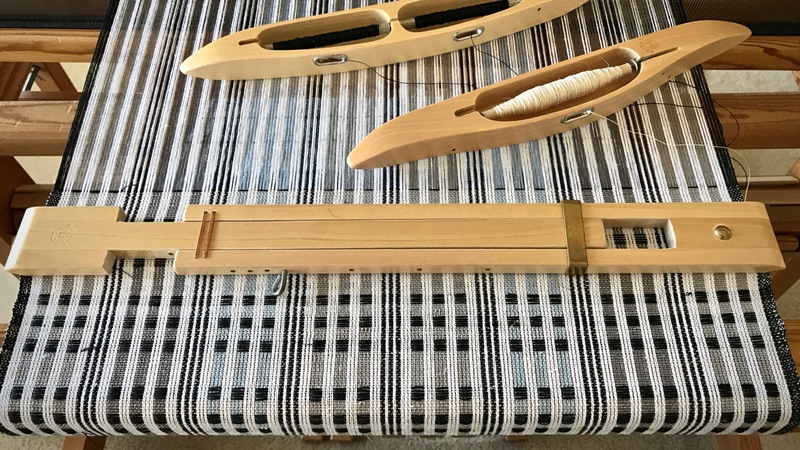 When I weave useful items on my loom, I want them to stand the test of time. I want these plattväv towels and table runner to outlive me. So, no skimping on quality. Time and patience are woven into the cloth, with artisan details and carefully applied skills. Perfection? No, not this side of heaven. But making the most of what I’ve been given is one way I show gratitude to my Maker. End of towel kit sample warp has enough room to weave a companion short table runner with plattväv squares. All weft tails will be trimmed after the fabric has been wet finished. Weaving as far as feasible. End of warp closes in. We have much to be grateful for. The Lord’s enduring love is of measureless worth and quality. It’s the basis for our unwavering hope, which sustains us through every adversity. This isn’t a knowledge of the love of God. This is the actual love of God, poured into willing hearts. Love changes everything. This love is the weft that makes perfect sense for the completion of something as valued as you or me. What if every fiber of our being reflected the love of God? How beautiful! May your finest qualities be seen and cherished. PS Plattväv towel kit is in development. 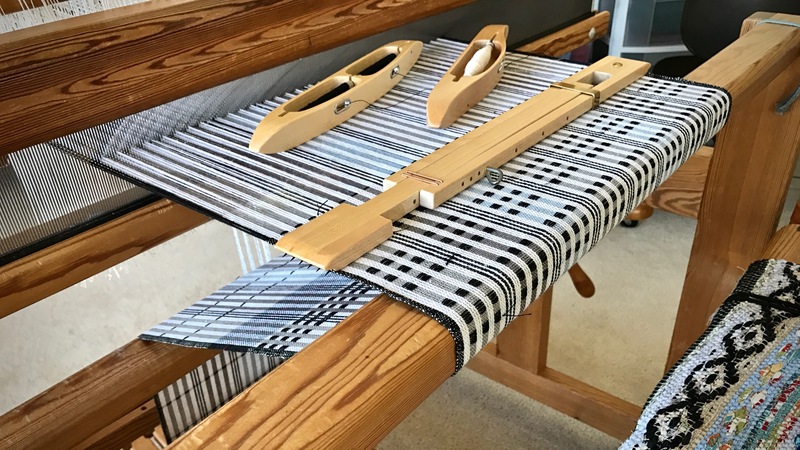 The kit includes a pre-wound warp and sufficient weft to weave four hand towels, and one companion short table runner/table square. PLUS, special access to one or two short instructional videos. When your kit is complete, where might one purchase it? Hi Cate, When the kits are ready, I will announce it here on my blog, and on my Instagram feed (@celloweaver). They will be available for purchase in my Etsy shop. I agree with you that Bockens offers the best linen weaving yarns on the market. The end product lasts a lifetime. I have some handwoven articles (placemats) that have been in constant use for over 40 years. Judy, In use for 40 years! That’s impressive. Yes, that’s exactly why I use Bockens linen. I want it to last. I can’t wait for a kit! Hi Liberty, It won’t be long before the kits are ready! Oh my are those beautiful!!! I hope the kit is ready by May as I’m getting a new to me Fireside loom then. I would love for this project to be the christening of my new loom. Wonderful work again and thank you so much for your inspiration. Ruth, How exciting for you to be getting a new loom! The kits should be ready before May for sure. What an honor to be considered for a christening project! Karen, your blog posts are beautiful! I love how you “weave” your faith into each entry! You have a gift for writing as well as weaving!!! Hi Maria, I appreciate your kind words so much! It makes me happy to hear that you enjoy reading these posts from my heart.